For other theorems named after Pierre de Fermat, see Fermat's theorem. For the book by Simon Singh, see Fermat's Last Theorem (book). 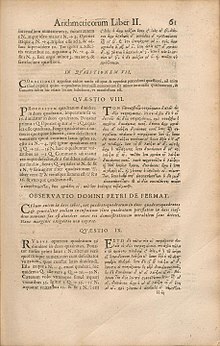 The 1670 edition of Diophantus' Arithmetica includes Fermat's commentary, referred to as his "Last Theorem" (Observatio Domini Petri de Fermat), posthumously published by his son. In number theory Fermat's Last Theorem (sometimes called Fermat's conjecture, especially in older texts) states that no three positive integers a, b, and c satisfy the equation an + bn = cn for any integer value of n greater than 2. The cases n = 1 and n = 2 have been known since antiquity to have an infinite number of solutions. The proposition was first conjectured by Pierre de Fermat in 1637 in the margin of a copy of Arithmetica; Fermat added that he had a proof that was too large to fit in the margin. However, there were first doubts about it since the publication was done by his son without his consent, after Fermat's death. After 358 years of effort by mathematicians, the first successful proof was released in 1994 by Andrew Wiles, and formally published in 1995; it was described as a 'stunning advance' in the citation for Wiles' Abel Prize award in 2016. It also proved much of the modularity theorem and opened up entire new approaches to numerous other problems and mathematically powerful modularity lifting techniques. The unsolved problem stimulated the development of algebraic number theory in the 19th century and the proof of the modularity theorem in the 20th century. It is among the most notable theorems in the history of mathematics and prior to its proof was in the Guinness Book of World Records as the "most difficult mathematical problem" in part because the theorem has the largest number of unsuccessful proofs. The Pythagorean equation, x2 + y2 = z2, has an infinite number of positive integer solutions for x, y, and z; these solutions are known as Pythagorean triples (with the simplest example 3,4,5). Around 1637, Fermat wrote in the margin of a book that the more general equation an + bn = cn had no solutions in positive integers if n is an integer greater than 2. Although he claimed to have a general proof of his conjecture, Fermat left no details of his proof, and no proof by him has ever been found. His claim was discovered some 30 years later, after his death. This claim, which came to be known as Fermat's Last Theorem, stood unsolved for the next three and a half centuries. The claim eventually became one of the most notable unsolved problems of mathematics. Attempts to prove it prompted substantial development in number theory, and over time Fermat's Last Theorem gained prominence as an unsolved problem in mathematics. The special case n = 4 - proved by Fermat himself - is sufficient to establish that if the theorem is false for some exponent n that is not a prime number, it must also be false for some smaller n, so only prime values of n need further investigation[note 1]. Over the next two centuries (1637–1839), the conjecture was proved for only the primes 3, 5, and 7, although Sophie Germain innovated and proved an approach that was relevant to an entire class of primes. In the mid-19th century, Ernst Kummer extended this and proved the theorem for all regular primes, leaving irregular primes to be analyzed individually. Building on Kummer's work and using sophisticated computer studies, other mathematicians were able to extend the proof to cover all prime exponents up to four million, but a proof for all exponents was inaccessible (meaning that mathematicians generally considered a proof impossible, exceedingly difficult, or unachievable with current knowledge). Separately, around 1955, Japanese mathematicians Goro Shimura and Yutaka Taniyama suspected a link might exist between elliptic curves and modular forms, two completely different areas of mathematics. Known at the time as the Taniyama–Shimura–Weil conjecture, and (eventually) as the modularity theorem, it stood on its own, with no apparent connection to Fermat's Last Theorem. It was widely seen as significant and important in its own right, but was (like Fermat's theorem) widely considered completely inaccessible to proof. In 1984, Gerhard Frey noticed an apparent link between these two previously unrelated and unsolved problems. An outline suggesting this could be proved was given by Frey. The full proof that the two problems were closely linked was accomplished in 1986 by Ken Ribet, building on a partial proof by Jean-Pierre Serre, who proved all but one part known as the "epsilon conjecture" (see: Ribet's Theorem and Frey curve). These papers by Frey, Serre and Ribet showed that if the Modularity Theorem could be proven for at least the semi-stable class of elliptic curves, a proof of Fermat's Last Theorem would also follow automatically. The connection is described below: any solution that could contradict Fermat's Last Theorem could also be used to contradict the Modularity Theorem. So if the modularity theorem were found to be true, then by definition no solution contradicting Fermat's Last Theorem could exist, which would therefore have to be true as well. On hearing that Ribet had proven Frey's link to be correct, English mathematician Andrew Wiles, who had a childhood fascination with Fermat's Last Theorem and had a background of working with elliptic curves and related fields, decided to try to prove the Taniyama–Shimura conjecture as a way to prove Fermat's Last Theorem. In 1993, after six years of working secretly on the problem, Wiles succeeded in proving enough of the conjecture to prove Fermat's Last Theorem. Wiles's paper was massive in size and scope. A flaw was discovered in one part of his original paper during peer review and required a further year and collaboration with a past student, Richard Taylor, to resolve. As a result, the final proof in 1995 was accompanied by a smaller joint paper showing that the fixed steps were valid. Wiles's achievement was reported widely in the popular press, and was popularized in books and television programs. The remaining parts of the Taniyama–Shimura–Weil conjecture, now proven and known as the Modularity theorem, were subsequently proved by other mathematicians, who built on Wiles's work between 1996 and 2001. For his proof, Wiles was honoured and received numerous awards, including the 2016 Abel Prize. There are several alternative ways to state Fermat's Last Theorem that are mathematically equivalent to the original statement of the problem. In order to state them, we use mathematical notation: let N be the set of natural numbers 1, 2, 3, ..., let Z be the set of integers 0, ±1, ±2, ..., and let Q be the set of rational numbers a/b where a and b are in Z with b≠0. In what follows we will call a solution to xn + yn = zn where one or more of x, y, or z is zero a trivial solution. A solution where all three are non-zero will be called a non-trivial solution. For comparison's sake we start with the original formulation. Original statement. With n, x, y, z ∈ N (meaning n, x, y, z are all positive whole numbers) and n > 2 the equation xn + yn = zn has no solutions. Equivalent statement 1: xn + yn = zn, where integer n ≥ 3, has no non-trivial solutions x, y, z ∈ Z. The equivalence is clear if n is even. If n is odd and all three of x, y, z are negative then we can replace x, y, z with −x, −y, −z to obtain a solution in N. If two of them are negative, it must be x and z or y and z. If x, z are negative and y is positive, then we can rearrange to get (−z)n + yn = (−x)n resulting in a solution in N; the other case is dealt with analogously. Now if just one is negative, it must be x or y. If x is negative, and y and z are positive, then it can be rearranged to get (−x)n + zn = yn again resulting in a solution in N; if y is negative, the result follows symmetrically. Thus in all cases a nontrivial solution in Z would also mean a solution exists in N, the original formulation of the problem. Equivalent statement 2: xn + yn = zn, where integer n ≥ 3, has no non-trivial solutions x, y, z ∈ Q. This is because the exponent of x, y and z are equal (to n), so if there is a solution in Q then it can be multiplied through by an appropriate common denominator to get a solution in Z, and hence in N.
Equivalent statement 3: xn + yn = 1, where integer n ≥ 3, has no non-trivial solutions x, y ∈ Q. A non-trivial solution a, b, c ∈ Z to xn + yn = zn yields the non-trivial solution a/c, b/c ∈ Q for vn + wn = 1. Conversely, a solution a/b, c/d ∈ Q to vn + wn = 1 yields the non-trivial solution ad, cb, bd for xn + yn = zn. This last formulation is particularly fruitful, because it reduces the problem from a problem about surfaces in three dimensions to a problem about curves in two dimensions. Furthermore, it allows working over the field Q, rather than over the ring Z; fields exhibit more structure than rings, which allows for deeper analysis of their elements. Equivalent statement 4 – connection to elliptic curves: If a, b, c is a non-trivial solution to xp + yp = zp , p odd prime, then y2 = x(x − ap)(x + bp) (Frey curve) will be an elliptic curve. Examining this elliptic curve with Ribet's theorem shows that it does not have a modular form. However, the proof by Andrew Wiles proves that any equation of the form y2 = x(x − an)(x + bn) does have a modular form. Any non-trivial solution to xp + yp = zp (with p an odd prime) would therefore create a contradiction, which in turn proves that no non-trivial solutions exist. In other words, any solution that could contradict Fermat's Last Theorem could also be used to contradict the Modularity Theorem. So if the modularity theorem were found to be true, then it would follow that no contradiction to Fermat's Last Theorem could exist either. As described above, the discovery of this equivalent statement was crucial to the eventual solution of Fermat's Last Theorem, as it provided a means by which it could be 'attacked' for all numbers at once. Diophantus's major work is the Arithmetica, of which only a portion has survived. 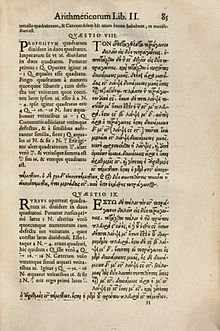 Fermat's conjecture of his Last Theorem was inspired while reading a new edition of the Arithmetica, that was translated into Latin and published in 1621 by Claude Bachet. Problem II.8 in the 1621 edition of the Arithmetica of Diophantus. On the right is the margin that was too small to contain Fermat's alleged proof of his "last theorem". Problem II.8 of the Arithmetica asks how a given square number is split into two other squares; in other words, for a given rational number k, find rational numbers u and v such that k2 = u2 + v2. Diophantus shows how to solve this sum-of-squares problem for k = 4 (the solutions being u = 16/5 and v = 12/5). Cubum autem in duos cubos, aut quadratoquadratum in duos quadratoquadratos & generaliter nullam in infinitum ultra quadratum potestatem in duos eiusdem nominis fas est dividere cuius rei demonstrationem mirabilem sane detexi. Hanc marginis exiguitas non caperet. It is impossible to separate a cube into two cubes, or a fourth power into two fourth powers, or in general, any power higher than the second, into two like powers. I have discovered a truly marvelous proof of this, which this margin is too narrow to contain. After Fermat’s death in 1665, his son Clément-Samuel Fermat produced a new edition of the book (1670) augmented with his father’s comments. Although not actually a theorem at the time (meaning a mathematical statement for which proof exists), the margin note became known over time as Fermat’s Last Theorem, as it was the last of Fermat’s asserted theorems to remain unproved. It is not known whether Fermat had actually found a valid proof for all exponents n, but it appears unlikely. Only one related proof by him has survived, namely for the case n = 4, as described in the section Proofs for specific exponents. While Fermat posed the cases of n = 4 and of n = 3 as challenges to his mathematical correspondents, such as Marin Mersenne, Blaise Pascal, and John Wallis, he never posed the general case. Moreover, in the last thirty years of his life, Fermat never again wrote of his "truly marvelous proof" of the general case, and never published it. Van der Poorten suggests that while the absence of a proof is insignificant, the lack of challenges means Fermat realised he did not have a proof; he quotes Weil as saying Fermat must have briefly deluded himself with an irretrievable idea. The techniques Fermat might have used in such a "marvelous proof" are unknown. Taylor and Wiles's proof relies on 20th-century techniques. Fermat's proof would have had to be elementary by comparison, given the mathematical knowledge of his time. While Harvey Friedman's grand conjecture implies that any provable theorem (including Fermat's last theorem) can be proved using only 'elementary function arithmetic', such a proof need be ‘elementary’ only in a technical sense and could involve millions of steps, and thus be far too long to have been Fermat’s proof. Fermat's infinite descent for Fermat's Last Theorem case n=4 in the 1670 edition of the Arithmetica of Diophantus (pp. 338–339). has no primitive solutions in integers (no pairwise coprime solutions). In turn, this proves Fermat's Last Theorem for the case n = 4, since the equation a4 + b4 = c4 can be written as a4 + b4 = (c2)2. Alternative proofs of the case n = 4 were developed later by Frénicle de Bessy (1676), Leonhard Euler (1738), Kausler (1802), Peter Barlow (1811), Adrien-Marie Legendre (1830), Schopis (1825), Olry Terquem (1846), Joseph Bertrand (1851), Victor Lebesgue (1853, 1859, 1862), Théophile Pépin (1883), Tafelmacher (1893), David Hilbert (1897), Bendz (1901), Gambioli (1901), Leopold Kronecker (1901), Bang (1905), Sommer (1907), Bottari (1908), Karel Rychlík (1910), Nutzhorn (1912), Robert Carmichael (1913), Hancock (1931), Vrǎnceanu (1966),, Grant and Perella (1999), Barbara (2007), and Dolan (2011). (ad)e + (bd)e = (cd)e.
Thus, to prove that Fermat's equation has no solutions for n > 2, it would suffice to prove that it has no solutions for at least one prime factor of every n. Each integer n > 2 is divisible by 4 or by an odd prime number (or both). Therefore, Fermat's Last Theorem could be proved for all n if it could be proved for n = 4 and for all odd primes p.
In the two centuries following its conjecture (1637–1839), Fermat's Last Theorem was proved for three odd prime exponents p = 3, 5 and 7. The case p = 3 was first stated by Abu-Mahmud Khojandi (10th century), but his attempted proof of the theorem was incorrect. In 1770, Leonhard Euler gave a proof of p = 3, but his proof by infinite descent contained a major gap. However, since Euler himself had proved the lemma necessary to complete the proof in other work, he is generally credited with the first proof. Independent proofs were published by Kausler (1802), Legendre (1823, 1830), Calzolari (1855), Gabriel Lamé (1865), Peter Guthrie Tait (1872), Günther (1878),[full citation needed] Gambioli (1901), Krey (1909),[full citation needed] Rychlík (1910), Stockhaus (1910), Carmichael (1915), Johannes van der Corput (1915), Axel Thue (1917),[full citation needed] and Duarte (1944). The case p = 5 was proved independently by Legendre and Peter Gustav Lejeune Dirichlet around 1825. Alternative proofs were developed by Carl Friedrich Gauss (1875, posthumous), Lebesgue (1843), Lamé (1847), Gambioli (1901), Werebrusow (1905),[full citation needed] Rychlík (1910),[dubious – discuss][full citation needed] van der Corput (1915), and Guy Terjanian (1987). The case p = 7 was proved by Lamé in 1839. His rather complicated proof was simplified in 1840 by Lebesgue, and still simpler proofs were published by Angelo Genocchi in 1864, 1874 and 1876. Alternative proofs were developed by Théophile Pépin (1876) and Edmond Maillet (1897). Fermat's Last Theorem was also proved for the exponents n = 6, 10, and 14. Proofs for n = 6 were published by Kausler, Thue, Tafelmacher, Lind, Kapferer, Swift, and Breusch. Similarly, Dirichlet and Terjanian each proved the case n = 14, while Kapferer and Breusch each proved the case n = 10. Strictly speaking, these proofs are unnecessary, since these cases follow from the proofs for n = 3, 5, and 7, respectively. Nevertheless, the reasoning of these even-exponent proofs differs from their odd-exponent counterparts. Dirichlet's proof for n = 14 was published in 1832, before Lamé's 1839 proof for n = 7. All proofs for specific exponents used Fermat's technique of infinite descent, either in its original form, or in the form of descent on elliptic curves or abelian varieties. The details and auxiliary arguments, however, were often ad hoc and tied to the individual exponent under consideration. Since they became ever more complicated as p increased, it seemed unlikely that the general case of Fermat's Last Theorem could be proved by building upon the proofs for individual exponents. Although some general results on Fermat's Last Theorem were published in the early 19th century by Niels Henrik Abel and Peter Barlow, the first significant work on the general theorem was done by Sophie Germain. In the early 19th century, Sophie Germain developed several novel approaches to prove Fermat's Last Theorem for all exponents. First, she defined a set of auxiliary primes θ constructed from the prime exponent p by the equation θ = 2hp + 1, where h is any integer not divisible by three. She showed that, if no integers raised to the pth power were adjacent modulo θ (the non-consecutivity condition), then θ must divide the product xyz. Her goal was to use mathematical induction to prove that, for any given p, infinitely many auxiliary primes θ satisfied the non-consecutivity condition and thus divided xyz; since the product xyz can have at most a finite number of prime factors, such a proof would have established Fermat's Last Theorem. Although she developed many techniques for establishing the non-consecutivity condition, she did not succeed in her strategic goal. She also worked to set lower limits on the size of solutions to Fermat's equation for a given exponent p, a modified version of which was published by Adrien-Marie Legendre. As a byproduct of this latter work, she proved Sophie Germain's theorem, which verified the first case of Fermat's Last Theorem (namely, the case in which p does not divide xyz) for every odd prime exponent less than 270, and for all primes p such that at least one of 2p+1, 4p+1, 8p+1, 10p+1, 14p+1 and 16p+1 is prime (specially, the primes p such that 2p+1 is prime are called Sophie Germain primes). Germain tried unsuccessfully to prove the first case of Fermat's Last Theorem for all even exponents, specifically for n = 2p, which was proved by Guy Terjanian in 1977. In 1985, Leonard Adleman, Roger Heath-Brown and Étienne Fouvry proved that the first case of Fermat's Last Theorem holds for infinitely many odd primes p.
In 1847, Gabriel Lamé outlined a proof of Fermat's Last Theorem based on factoring the equation xp + yp = zp in complex numbers, specifically the cyclotomic field based on the roots of the number 1. His proof failed, however, because it assumed incorrectly that such complex numbers can be factored uniquely into primes, similar to integers. This gap was pointed out immediately by Joseph Liouville, who later read a paper that demonstrated this failure of unique factorisation, written by Ernst Kummer. Kummer set himself the task of determining whether the cyclotomic field could be generalized to include new prime numbers such that unique factorisation was restored. He succeeded in that task by developing the ideal numbers. Using the general approach outlined by Lamé, Kummer proved both cases of Fermat's Last Theorem for all regular prime numbers. However, he could not prove the theorem for the exceptional primes (irregular primes) that conjecturally occur approximately 39% of the time; the only irregular primes below 270 are 37, 59, 67, 101, 103, 131, 149, 157, 233, 257 and 263. In the 1920s, Louis Mordell posed a conjecture that implied that Fermat's equation has at most a finite number of nontrivial primitive integer solutions, if the exponent n is greater than two. This conjecture was proved in 1983 by Gerd Faltings, and is now known as Faltings's theorem. In the latter half of the 20th century, computational methods were used to extend Kummer's approach to the irregular primes. In 1954, Harry Vandiver used a SWAC computer to prove Fermat's Last Theorem for all primes up to 2521. By 1978, Samuel Wagstaff had extended this to all primes less than 125,000. By 1993, Fermat's Last Theorem had been proved for all primes less than four million. The strategy that ultimately led to a successful proof of Fermat's Last Theorem arose from the "astounding":211 Taniyama–Shimura–Weil conjecture, proposed around 1955—which many mathematicians believed would be near to impossible to prove,:223 and was linked in the 1980s by Gerhard Frey, Jean-Pierre Serre and Ken Ribet to Fermat's equation. By accomplishing a partial proof of this conjecture in 1994, Andrew Wiles ultimately succeeded in proving Fermat's Last Theorem, as well as leading the way to a full proof by others of what is now the modularity theorem. Around 1955, Japanese mathematicians Goro Shimura and Yutaka Taniyama observed a possible link between two apparently completely distinct branches of mathematics, elliptic curves and modular forms. The resulting modularity theorem (at the time known as the Taniyama–Shimura conjecture) states that every elliptic curve is modular, meaning that it can be associated with a unique modular form. would have such unusual properties that it was unlikely to be modular. This would conflict with the modularity theorem, which asserted that all elliptic curves are modular. As such, Frey observed that a proof of the Taniyama–Shimura–Weil conjecture might also simultaneously prove Fermat's Last Theorem. By contraposition, a disproof or refutation of Fermat's Last Theorem would disprove the Taniyama–Shimura–Weil conjecture. In plain English, Frey had shown that, if this intuition about his equation was correct, then any set of 4 numbers (a, b, c, n) capable of disproving Fermat's Last Theorem, could also be used to disprove the Taniyama–Shimura–Weil conjecture. Therefore if the latter were true, the former could not be disproven, and would also have to be true. Following this strategy, a proof of Fermat's Last Theorem required two steps. First, it was necessary to prove the modularity theorem – or at least to prove it for the types of elliptical curves that included Frey's equation (known as semistable elliptic curves). This was widely believed inaccessible to proof by contemporary mathematicians. :203–205, 223, 226 Second, it was necessary to show that Frey's intuition was correct: that if an elliptic curve were constructed in this way, using a set of numbers that were a solution of Fermat's equation, the resulting elliptic curve could not be modular. Frey showed that this was plausible but did not go as far as giving a full proof. The missing piece (the so-called "epsilon conjecture", now known as Ribet's theorem) was identified by Jean-Pierre Serre who also gave an almost-complete proof and the link suggested by Frey was finally proved in 1986 by Ken Ribet. Fermat's Last Theorem needed to be proven for all exponents n that were prime numbers. The modularity theorem – if proved for semi-stable elliptic curves – would mean that all semistable elliptic curves must be modular. The only way that both of these statements could be true, was if no solutions existed to Fermat's equation (because then no such curve could be created), which was what Fermat's Last Theorem said. As Ribet's Theorem was already proved, this meant that a proof of the Modularity Theorem would automatically prove Fermat's Last theorem was true as well. Ribet's proof of the epsilon conjecture in 1986 accomplished the first of the two goals proposed by Frey. 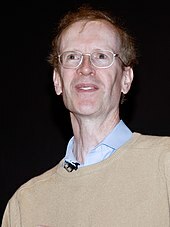 Upon hearing of Ribet's success, Andrew Wiles, an English mathematician with a childhood fascination with Fermat's Last Theorem, and who had worked on elliptic curves, decided to commit himself to accomplishing the second half: proving a special case of the modularity theorem (then known as the Taniyama–Shimura conjecture) for semistable elliptic curves. By mid-May 1993, Wiles felt able to tell his wife he thought he had solved the proof of Fermat's Last Theorem,:265 and by June he felt sufficiently confident to present his results in three lectures delivered on 21–23 June 1993 at the Isaac Newton Institute for Mathematical Sciences. Specifically, Wiles presented his proof of the Taniyama–Shimura conjecture for semistable elliptic curves; together with Ribet's proof of the epsilon conjecture, this implied Fermat's Last Theorem. However, it became apparent during peer review that a critical point in the proof was incorrect. It contained an error in a bound on the order of a particular group. The error was caught by several mathematicians refereeing Wiles's manuscript including Katz (in his role as reviewer), who alerted Wiles on 23 August 1993. The error would not have rendered his work worthless – each part of Wiles's work was highly significant and innovative by itself, as were the many developments and techniques he had created in the course of his work, and only one part was affected. :289, 296–297 However without this part proved, there was no actual proof of Fermat's Last Theorem. Wiles spent almost a year trying to repair his proof, initially by himself and then in collaboration with his former student Richard Taylor, without success. By the end of 1993, rumours had spread that under scrutiny, Wiles's proof had failed, but how seriously was not known. Mathematicians were beginning to pressure Wiles to disclose his work whether or not complete, so that the wider community could explore and use whatever he had managed to accomplish. But instead of being fixed, the problem, which had originally seemed minor, now seemed very significant, far more serious, and less easy to resolve. Wiles states that on the morning of 19 September 1994, he was on the verge of giving up and was almost resigned to accepting that he had failed, and to publishing his work so that others could build on it and find the error. He adds that he was having a final look to try and understand the fundamental reasons for why his approach could not be made to work, when he had a sudden insight – that the specific reason why the Kolyvagin–Flach approach would not work directly also meant that his original attempts using Iwasawa theory could be made to work, if he strengthened it using his experience gained from the Kolyvagin–Flach approach. Fixing one approach with tools from the other approach would resolve the issue for all the cases that were not already proven by his refereed paper. He described later that Iwasawa theory and the Kolyvagin–Flach approach were each inadequate on their own, but together they could be made powerful enough to overcome this final hurdle. "I was sitting at my desk examining the Kolyvagin–Flach method. It wasn't that I believed I could make it work, but I thought that at least I could explain why it didn’t work. Suddenly I had this incredible revelation. I realised that, the Kolyvagin–Flach method wasn't working, but it was all I needed to make my original Iwasawa theory work from three years earlier. So out of the ashes of Kolyvagin–Flach seemed to rise the true answer to the problem. It was so indescribably beautiful; it was so simple and so elegant. I couldn't understand how I'd missed it and I just stared at it in disbelief for twenty minutes. Then during the day I walked around the department, and I'd keep coming back to my desk looking to see if it was still there. It was still there. I couldn't contain myself, I was so excited. It was the most important moment of my working life. Nothing I ever do again will mean as much." On 24 October 1994, Wiles submitted two manuscripts, "Modular elliptic curves and Fermat's Last Theorem" and "Ring theoretic properties of certain Hecke algebras", the second of which was co-authored with Taylor and proved that certain conditions were met that were needed to justify the corrected step in the main paper. The two papers were vetted and published as the entirety of the May 1995 issue of the Annals of Mathematics. These papers established the modularity theorem for semistable elliptic curves, the last step in proving Fermat's Last Theorem, 358 years after it was conjectured. The full Taniyama–Shimura–Weil conjecture was finally proved by Diamond (1996), Conrad, Diamond & Taylor (1999), and Breuil et al. (2001) who, building on Wiles's work, incrementally chipped away at the remaining cases until the full result was proved. The now fully proved conjecture became known as the modularity theorem. Fermat's Last Theorem considers solutions to the Fermat equation: an + bn = cn with positive integers a, b, and c and an integer n greater than 2. There are several generalizations of the Fermat equation to more general equations that allow the exponent n to be a negative integer or rational, or to consider three different exponents. In particular, the exponents m, n, k need not be equal, whereas Fermat's last theorem considers the case m = n = k.
The Beal conjecture, also known as the Mauldin conjecture and the Tijdeman-Zagier conjecture, states that there are no solutions to the generalized Fermat equation in positive integers a, b, c, m, n, k with a, b, and c being pairwise coprime and all of m, n, k being greater than 2. The statement is about the finiteness of the set of solutions because there are 10 known solutions. for positive integers r, s, t with s and t coprime. are different complex 6th roots of the same real number. for positive, coprime integers m, k.
so (a, b, c) is a Pythagorean triple. , which is impossible by Fermat's Last Theorem. The abc conjecture roughly states that for three positive integers, a, b and c (hence the name) that are coprime and satisfy a + b = c, then the radical d of abc is usually not much smaller than c. In particular, the abc conjecture in its most standard formulation implies Fermat's last theorem for n that are sufficiently large. An effective version of the abc conjecture implies Fermat's last theorem outright. In 1816, and again in 1850, the French Academy of Sciences offered a prize for a general proof of Fermat's Last Theorem. In 1857, the Academy awarded 3,000 francs and a gold medal to Kummer for his research on ideal numbers, although he had not submitted an entry for the prize. Another prize was offered in 1883 by the Academy of Brussels. In 1908, the German industrialist and amateur mathematician Paul Wolfskehl bequeathed 100,000 gold marks—a large sum at the time—to the Göttingen Academy of Sciences to offer as a prize for a complete proof of Fermat's Last Theorem. On 27 June 1908, the Academy published nine rules for awarding the prize. Among other things, these rules required that the proof be published in a peer-reviewed journal; the prize would not be awarded until two years after the publication; and that no prize would be given after 13 September 2007, roughly a century after the competition was begun. Wiles collected the Wolfskehl prize money, then worth $50,000, on 27 June 1997. In March 2016, Wiles was awarded the Norwegian government's Abel prize worth €600,000 for "his stunning proof of Fermat’s Last Theorem by way of the modularity conjecture for semistable elliptic curves, opening a new era in number theory." Prior to Wiles's proof, thousands of incorrect proofs were submitted to the Wolfskehl committee, amounting to roughly 10 feet (3 meters) of correspondence. In the first year alone (1907–1908), 621 attempted proofs were submitted, although by the 1970s, the rate of submission had decreased to roughly 3–4 attempted proofs per month. According to F. Schlichting, a Wolfskehl reviewer, most of the proofs were based on elementary methods taught in schools, and often submitted by "people with a technical education but a failed career". In the words of mathematical historian Howard Eves, "Fermat's Last Theorem has the peculiar distinction of being the mathematical problem for which the greatest number of incorrect proofs have been published." on a blackboard, which appears to be a counterexample to Fermat's Last Theorem. The equation is incorrect but appears to be correct if tested on a calculator displaying 10 significant figures. ^ If the exponent "n" were not prime or 4, then it would be possible to write n either as a product of two smaller integers (n = P*Q) in which P is a prime number greater than 2, and then an = aP*Q = (aQ)P for each of a, b, and c—i.e., an equivalent solution would also have to exist for the prime power P that is smaller than n, as well; or else as n would be a power of 2 greater than four and writing n=4*Q, the same argument would hold. ^ This elliptic curve was first suggested in the 1960s by Yves Hellegouarch [de], but he did not call attention to its non-modularity. For more details, see Hellegouarch, Yves (2001). Invitation to the Mathematics of Fermat-Wiles. Academic Press. ISBN 978-0-12-339251-0. ^ a b Singh, pp. 18–20. ^ a b "Nigel Boston,p.5 "THE PROOF OF FERMAT'S LAST THEOREM"" (PDF). ^ "Science and Technology". The Guinness Book of World Records. Guinness Publishing Ltd. 1995. ^ Singh p. 144 quotes Wiles's reaction to this news: "I was electrified. I knew that moment that the course of my life was changing because this meant that to prove Fermat’s Last Theorem all I had to do was to prove the Taniyama–Shimura conjecture. It meant that my childhood dream was now a respectable thing to work on." ^ "Fermat's last theorem earns Andrew Wiles the Abel Prize". Nature. 15 March 2016. Retrieved 15 March 2016. ^ Wiles, Andrew (1995). "Modular elliptic curves and Fermat's Last Theorem" (PDF). Annals of Mathematics. 141 (3): 448. doi:10.2307/2118559. JSTOR 2118559. OCLC 37032255. Frey's suggestion, in the notation of the following theorem, was to show that the (hypothetical) elliptic curve y2 = x(x + up)(x – vp) could not be modular. ^ Ribet, Ken (1990). "On modular representations of Gal(Q/Q) arising from modular forms" (PDF). Inventiones Mathematicae. 100 (2): 432. Bibcode:1990InMat.100..431R. doi:10.1007/BF01231195. MR 1047143. ^ Stillwell J (2003). Elements of Number Theory. New York: Springer-Verlag. pp. 110–112. ISBN 0-387-95587-9. Retrieved 2016-03-17. ^ Aczel, pp. 44–45; Singh, pp. 56–58. ^ Dickson, p. 731; Singh, pp. 60–62; Aczel, p. 9. ^ Singh, p. 67; Aczel, p. 10. ^ Ribenboim, pp. 13, 24. ^ van der Poorten, Notes and Remarks 1.2, p. 5. ^ van der Poorten, loc. cit. ^ André Weil (1984). Number Theory: An approach through history. From Hammurapi to Legendre. Basel, Switzerland: Birkhäuser. p. 104. ^ Freeman L. "Fermat's One Proof". Retrieved 23 May 2009. ^ Dickson, pp. 615–616; Aczel, p. 44. ^ Frénicle de Bessy, Traité des Triangles Rectangles en Nombres, vol. I, 1676, Paris. Reprinted in Mém. Acad. Roy. Sci., 5, 1666–1699 (1729). ^ Euler L (1738). "Theorematum quorundam arithmeticorum demonstrationes". Novi Commentarii academiae scientiarum Petropolitanae. 10: 125–146. . Reprinted Opera omnia, ser. I, "Commentationes Arithmeticae", vol. I, pp. 38–58, Leipzig:Teubner (1915). ^ a b c Kausler CF (1802). "Nova demonstratio theorematis nec summam, nec differentiam duorum cuborum cubum esse posse". 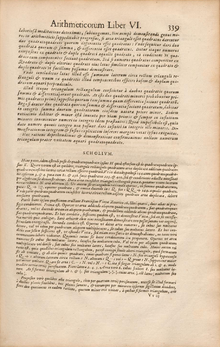 Novi Acta Academiae Scientiarum Imperialis Petropolitanae. 13: 245–253. ^ Barlow P (1811). An Elementary Investigation of Theory of Numbers. St. Paul's Church-Yard, London: J. Johnson. pp. 144–145. ^ a b Legendre AM (1830). Théorie des Nombres (Volume II) (3rd ed.). Paris: Firmin Didot Frères. Reprinted in 1955 by A. Blanchard (Paris). ^ Schopis (1825). Einige Sätze aus der unbestimmten Analytik. Gummbinnen: Programm. ^ Terquem O (1846). "Théorèmes sur les puissances des nombres". Nouvelles Annales de Mathématiques. 5: 70–87. ^ Bertrand J (1851). Traité Élémentaire d'Algèbre. Paris: Hachette. pp. 217–230, 395. ^ Lebesgue VA (1853). "Résolution des équations biquadratiques z2 = x4 ± 2my4, z2 = 2mx4 − y4, 2mz2 = x4 ± y4". Journal de Mathématiques Pures et Appliquées. 18: 73–86. Lebesgue VA (1859). Exercices d'Analyse Numérique. Paris: Leiber et Faraguet. pp. 83–84, 89. Lebesgue VA (1862). Introduction à la Théorie des Nombres. Paris: Mallet-Bachelier. pp. 71–73. ^ Pepin T (1883). "Étude sur l'équation indéterminée ax4 + by4 = cz2". Atti della Accademia Nazionale dei Lincei. Classe di Scienze Fisiche, Matematiche e Naturali. Rendiconti Lincei. Serie IX. Matematica e Applicazioni. 36: 34–70. ^ A. Tafelmacher (1893). "Sobre la ecuación x4 + y4 = z4". Anales de la Universidad de Chile. 84: 307–320. doi:10.5354/0717-8883.1893.20645. ^ Hilbert D (1897). "Die Theorie der algebraischen Zahlkörper". Jahresbericht der Deutschen Mathematiker-Vereinigung. 4: 175–546. Reprinted in 1965 in Gesammelte Abhandlungen, vol. I by New York:Chelsea. ^ Bendz TR (1901). Öfver diophantiska ekvationen xn' + yn = zn (Thesis). Uppsala: Almqvist & Wiksells Boktrycken. ^ a b c Gambioli D (1901). "Memoria bibliographica sull'ultimo teorema di Fermat". Periodico di Matematiche. 16: 145–192. ^ Kronecker L (1901). Vorlesungen über Zahlentheorie, vol. I. Leipzig: Teubner. pp. 35–38. Reprinted by New York:Springer-Verlag in 1978. ^ Bang A (1905). "Nyt Bevis for at Ligningen x4 − y4 = z4, ikke kan have rationale Løsinger". Nyt tidsskrift for matematik. 16B: 31–35. JSTOR 24528323. ^ Sommer J (1907). Vorlesungen über Zahlentheorie. Leipzig: Teubner. ^ Bottari A (1908). "Soluzione intere dell'equazione pitagorica e applicazione alla dimostrazione di alcune teoremi della teoria dei numeri". Periodico di Matematiche. 23: 104–110. ^ a b Rychlik K (1910). "On Fermat's last theorem for n = 4 and n = 3 (in Bohemian)". Časopis pro pěstování matematiky a fysiky. 39: 65–86. ^ Nutzhorn F (1912). "Den ubestemte Ligning x4 + y4 = z4". Nyt tidsskrift for matematik. 23B: 33–38. ^ Carmichael RD (1913). "On the impossibility of certain Diophantine equations and systems of equations". American Mathematical Monthly. Mathematical Association of America. 20 (7): 213–221. doi:10.2307/2974106. JSTOR 2974106. ^ Hancock H (1931). Foundations of the Theory of Algebraic Numbers, vol. I. New York: Macmillan. ^ Vrǎnceanu G (1966). "Asupra teorema lui Fermat pentru n=4". Gazeta Matematică Seria A. 71: 334–335. Reprinted in 1977 in Opera matematica, vol. 4, pp. 202–205, Bucureşti: Editura Academiei Republicii Socialiste România. ^ Grant, Mike, and Perella, Malcolm, "Descending to the irrational", Mathematical Gazette 83, July 1999, pp. 263–267. ^ Barbara, Roy, "Fermat's last theorem in the case n=4", Mathematical Gazette 91, July 2007, 260–262. ^ Dolan, Stan, "Fermat's method of descente infinie", Mathematical Gazette 95, July 2011, 269–271. O'Connor, John J.; Robertson, Edmund F., "Abu Mahmud Hamid ibn al-Khidr Al-Khujandi", MacTutor History of Mathematics archive, University of St Andrews . ^ Euler L (1770) Vollständige Anleitung zur Algebra, Roy. Acad. Sci., St. Petersburg. ^ Freeman L. "Fermat's Last Theorem: Proof for n = 3". Retrieved 23 May 2009. ^ Ribenboim, pp. 24–25; Mordell, pp. 6–8; Edwards, pp. 39–40. ^ Aczel, p. 44; Edwards, pp. 40, 52–54. J. J. Mačys (2007). "On Euler's hypothetical proof". Mathematical Notes. 82 (3–4): 352–356. doi:10.1134/S0001434607090088. MR 2364600. ^ Ribenboim, pp. 33, 37–41. ^ Legendre AM (1823). "Recherches sur quelques objets d'analyse indéterminée, et particulièrement sur le théorème de Fermat". Mémoires de l'Académie royale des sciences. 6: 1–60. Reprinted in 1825 as the "Second Supplément" for a printing of the 2nd edition of Essai sur la Théorie des Nombres, Courcier (Paris). Also reprinted in 1909 in Sphinx-Oedipe, 4, 97–128. ^ Calzolari L (1855). Tentativo per dimostrare il teorema di Fermat sull'equazione indeterminata xn + yn = zn. Ferrara. ^ Lamé G (1865). "Étude des binômes cubiques x3 ± y3". Comptes rendus hebdomadaires des séances de l'Académie des Sciences. 61: 921–924, 961–965. ^ Tait PG (1872). "Mathematical Notes". Proceedings of the Royal Society of Edinburgh. 7: 144. doi:10.1017/s0370164600041857. ^ Günther S (1878). "Über die unbestimmte Gleichung x3 + y3 = z3". Sitzungsberichte Böhm. Ges. Wiss. : 112–120. ^ Krey H (1909). "Neuer Beweis eines arithmetischen Satzes". Math. Naturwiss. Blätter. 6: 179–180. ^ Stockhaus H (1910). Beitrag zum Beweis des Fermatschen Satzes. Leipzig: Brandstetter. ^ Carmichael RD (1915). Diophantine Analysis. New York: Wiley. ^ a b van der Corput JG (1915). "Quelques formes quadratiques et quelques équations indéterminées". Nieuw Archief voor Wiskunde. 11: 45–75. ^ Thue A (1917). "Et bevis for at ligningen A3 + B3 = C3 er unmulig i hele tal fra nul forskjellige tal A, B og C". Arch. Mat. Naturv. 34 (15). Reprinted in Selected Mathematical Papers (1977), Oslo:Universitetsforlaget, pp. 555–559. ^ Duarte FJ (1944). "Sobre la ecuación x3 + y3 + z3 = 0". Boletín de la Academia de Ciencias Físicas, Matemáticas y Naturales (Caracas). 8: 971–979. ^ Freeman L. "Fermat's Last Theorem: Proof for n = 5". Retrieved 23 May 2009. ^ Ribenboim, p. 49; Mordell, p. 8–9; Aczel, p. 44; Singh, p. 106. ^ Lebesgue VA (1843). "Théorèmes nouveaux sur l'équation indéterminée x5 + y5 = az5". Journal de Mathématiques Pures et Appliquées. 8: 49–70. ^ Lamé G (1847). "Mémoire sur la résolution en nombres complexes de l'équation A5 + B5 + C5 = 0". Journal de Mathématiques Pures et Appliquées. 12: 137–171. ^ Gambioli D (1903–1904). "Intorno all'ultimo teorema di Fermat". Il Pitagora. 10: 11–13, 41–42. ^ Werebrusow AS (1905). "On the equation x5 + y5 = Az5 (in Russian)". Moskov. Math. Samml. 25: 466–473. ^ Rychlik K (1910). "On Fermat's last theorem for n = 5 (in Bohemian)". Časopis Pěst. Mat. 39: 185–195, 305–317. ^ Terjanian G (1987). "Sur une question de V. A. Lebesgue". Annales de l'Institut Fourier. 37: 19–37. doi:10.5802/aif.1096. ^ Ribenboim, pp. 57–63; Mordell, p. 8; Aczel, p. 44; Singh, p. 106. ^ Lamé G (1839). "Mémoire sur le dernier théorème de Fermat". Comptes rendus hebdomadaires des séances de l'Académie des Sciences. 9: 45–46. Lamé G (1840). "Mémoire d'analyse indéterminée démontrant que l'équation x7 + y7 = z7 est impossible en nombres entiers". Journal de Mathématiques Pures et Appliquées. 5: 195–211. ^ Lebesgue VA (1840). "Démonstration de l'impossibilité de résoudre l'équation x7 + y7 + z7 = 0 en nombres entiers". Journal de Mathématiques Pures et Appliquées. 5: 276–279, 348–349. ^ Freeman L. "Fermat's Last Theorem: Proof for n = 7". Retrieved 23 May 2009. ^ Genocchi A (1864). "Intorno all'equazioni x7 + y7 + z7 = 0". Annali di Matematica Pura ed Applicata. 6: 287–288. doi:10.1007/bf03198884. Genocchi A (1874). "Sur l'impossibilité de quelques égalités doubles". Comptes rendus hebdomadaires des séances de l'Académie des Sciences. 78: 433–436. Genocchi A (1876). "Généralisation du théorème de Lamé sur l'impossibilité de l'équation x7 + y7 + z7 = 0". Comptes rendus hebdomadaires des séances de l'Académie des Sciences. 82: 910–913. ^ Pepin T (1876). "Impossibilité de l'équation x7 + y7 + z7 = 0". Comptes rendus hebdomadaires des séances de l'Académie des Sciences. 82: 676–679, 743–747. ^ Maillet E (1897). "Sur l'équation indéterminée axλt + byλt = czλt". Association française pour l'avancement des sciences, St. Etienne, Compte Rendu de la 26me Session, deuxième partie. 26: 156–168. ^ Thue A (1896). "Über die Auflösbarkeit einiger unbestimmter Gleichungen". Det Kongelige Norske Videnskabers Selskabs Skrifter. 7. Reprinted in Selected Mathematical Papers, pp. 19–30, Oslo:Universitetsforlaget (1977). ^ Tafelmacher WLA (1897). "La ecuación x3 + y3 = z2: Una demonstración nueva del teorema de fermat para el caso de las sestas potencias". Anales de la Universidad de Chile. 97: 63–80. ^ Lind B (1909). "Einige zahlentheoretische Sätze". Archiv der Mathematik und Physik. 15: 368–369. ^ a b Kapferer H (1913). "Beweis des Fermatschen Satzes für die Exponenten 6 und 10". Archiv der Mathematik und Physik. 21: 143–146. ^ Swift E (1914). "Solution to Problem 206". American Mathematical Monthly. 21: 238–239. doi:10.2307/2972379. ^ a b Breusch R (1960). "A simple proof of Fermat's last theorem for n = 6, n = 10". Mathematics Magazine. 33 (5): 279–281. doi:10.2307/3029800. JSTOR 3029800. ^ Dirichlet PGL (1832). "Démonstration du théorème de Fermat pour le cas des 14e puissances". Journal für die reine und angewandte Mathematik. 9: 390–393. Reprinted in Werke, vol. I, pp. 189–194, Berlin: G. Reimer (1889); reprinted New York:Chelsea (1969). ^ Terjanian G (1974). "L'équation x14 + y14 = z14 en nombres entiers". Bulletin des Sciences Mathématiques (sér. 2). 98: 91–95. ^ a b Edwards, p. 74. ^ Ribenboim P (1979). 13 Lectures on Fermat's Last Theorem. New York: Springer Verlag. pp. 51–54. ISBN 978-0-387-90432-0. ^ a b Laubenbacher R, Pengelley D (2007). "Voici ce que j'ai trouvé: Sophie Germain's grand plan to prove Fermat's Last Theorem" (PDF). Retrieved 19 May 2009. ^ Terjanian, G. (1977). "Sur l'équation x2p + y2p = z2p". Comptes Rendus de l'Académie des Sciences, Série A-B. 285: 973–975. ^ Adleman LM, Heath-Brown DR (June 1985). "The first case of Fermat's last theorem". Inventiones Mathematicae. Berlin: Springer. 79 (2): 409–416. Bibcode:1985InMat..79..409A. doi:10.1007/BF01388981. ^ Aczel, pp. 84–88; Singh, pp. 232–234. ^ Faltings G (1983). "Endlichkeitssätze für abelsche Varietäten über Zahlkörpern". Inventiones Mathematicae. 73 (3): 349–366. Bibcode:1983InMat..73..349F. doi:10.1007/BF01388432. ^ Ribenboim P (1979). 13 Lectures on Fermat's Last Theorem. New York: Springer Verlag. p. 202. ISBN 978-0-387-90432-0. ^ Buhler J, Crandell R, Ernvall R, Metsänkylä T (1993). "Irregular primes and cyclotomic invariants to four million". Mathematics of Computation. American Mathematical Society. 61 (203): 151–153. doi:10.2307/2152942. JSTOR 2152942. ^ Hamkins, Joel David (June 15, 2010). "Examples of eventual counterexamples, answer by J.D. Hamkins". mathoverflow.net. Retrieved June 15, 2017. ^ Frey G (1986). "Links between stable elliptic curves and certain diophantine equations". Annales Universitatis Saraviensis. Series Mathematicae. 1: 1–40. ^ Singh, pp. 194–198; Aczel, pp. 109–114. ^ Ribet, Ken (1990). "On modular representations of Gal(Q/Q) arising from modular forms" (PDF). Inventiones Mathematicae. 100 (2): 431–476. Bibcode:1990InMat.100..431R. doi:10.1007/BF01231195. MR 1047143. ^ Singh, p. 205; Aczel, pp. 117–118. ^ Singh, pp. 237–238; Aczel, pp. 121–122. ^ Singh, pp. 239–243; Aczel, pp. 122–125. ^ Singh, pp. 244–253; Aczel, pp. 1–4, 126–128. ^ a b c Singh, pp. 269–277. ^ Singh p. 186–187 (text condensed). ^ Wiles, Andrew (1995). "Modular elliptic curves and Fermat's Last Theorem" (PDF). Annals of Mathematics. 141 (3): 443–551. doi:10.2307/2118559. JSTOR 2118559. OCLC 37032255. ^ Taylor R, Wiles A (1995). "Ring theoretic properties of certain Hecke algebras". Annals of Mathematics. 141 (3): 553–572. doi:10.2307/2118560. JSTOR 2118560. OCLC 37032255. Archived from the original on 27 November 2001. ^ Diamond, Fred (1996). "On deformation rings and Hecke rings". Annals of Mathematics. Second Series. 144 (1): 137–166. doi:10.2307/2118586. ISSN 0003-486X. MR 1405946. ^ Conrad, Brian; Diamond, Fred; Taylor, Richard (1999). "Modularity of certain potentially Barsotti-Tate Galois representations". Journal of the American Mathematical Society. 12 (2): 521–567. doi:10.1090/S0894-0347-99-00287-8. ISSN 0894-0347. MR 1639612. ^ Breuil, Christophe; Conrad, Brian; Diamond, Fred; Taylor, Richard (2001). "On the modularity of elliptic curves over Q: wild 3-adic exercises". Journal of the American Mathematical Society. 14 (4): 843–939. doi:10.1090/S0894-0347-01-00370-8. ISSN 0894-0347. MR 1839918. ^ a b Barrow-Green, June; Leader, Imre; Gowers, Timothy (2008). The Princeton Companion to Mathematics. Princeton University Press. pp. 361–362. ^ "Mauldin / Tijdeman-Zagier Conjecture". Prime Puzzles. Retrieved 1 October 2016. ^ Elkies, Noam D. (2007). "The ABC's of Number Theory" (PDF). The Harvard College Mathematics Review. 1 (1). ^ Michel Waldschmidt (2004). "Open Diophantine Problems". Moscow Mathematics. 4: 245–305. arXiv:math/0312440. doi:10.17323/1609-4514-2004-4-1-245-305. ^ Crandall, Richard; Pomerance, Carl (2000). Prime Numbers: A Computational Perspective. Springer. p. 417. ISBN 978-0387-25282-7. ^ "Beal Conjecture". American Mathematical Society. Retrieved 21 August 2016. ^ Cai, Tianxin; Chen, Deyi; Zhang, Yong (2015). "A new generalization of Fermat's Last Theorem". Journal of Number Theory. 149: 33–45. ^ Mihailescu, Preda (2007). "A Cyclotomic Investigation of the Catalan -- Fermat Conjecture". Mathematica Gottingensis. ^ Lenstra Jr. H.W. (1992). "On the inverse Fermat equation". Discrete Mathematics. 106–107: 329–331. doi:10.1016/0012-365x(92)90561-s.
^ Newman M (1981). "A radical diophantine equation". Journal of Number Theory. 13: 495–498. doi:10.1016/0022-314x(81)90040-8. ^ Bennett, Curtis D.; Glass, A. M. W.; Székely, Gábor J. (2004). "Fermat's last theorem for rational exponents". American Mathematical Monthly. 111 (4): 322–329. doi:10.2307/4145241. MR 2057186. ^ Voles, Roger (July 1999). "Integer solutions of a−2 + b−2 = d−2". Mathematical Gazette. 83: 269–271. ^ Richinick, Jennifer (July 2008). "The upside-down Pythagorean Theorem". Mathematical Gazette. 92: 313–317. ^ Lang, Serge (2002). Algebra. Graduate Texts in Mathematics. 211. Springer-Verlag New York. p. 196. ^ Granville, Andrew; Tucker, Thomas (2002). "It's As Easy As abc" (PDF). Notices of the AMS. 49 (10): 1224–1231. ^ Aczel, p. 69; Singh, p. 105. ^ a b Koshy T (2001). Elementary number theory with applications. New York: Academic Press. p. 544. ISBN 978-0-12-421171-1. ^ Singh, pp. 120–125, 131–133, 295–296; Aczel, p. 70. ^ "The Abel Prize citation 2016" (PDF). The Abel Prize. The Abel Prize Committee. March 2016. Retrieved 16 March 2016. ^ Singh, Simon (2013). The Simpsons and their Mathematical Secrets. London. pp. 35–36. ISBN 978-1-4088-3530-2. ^ Kevin Knudson (20 August 2015). "The Math Of Star Trek: How Trying To Solve Fermat's Last Theorem Revolutionized Mathematics". Forbes. ^ "Are mathematicians finally satisfied with Andrew Wiles's proof of Fermat's Last Theorem? Why has this theorem been so difficult to prove?". Scientific American. 21 October 1999. Retrieved 16 March 2016. Aczel, Amir (30 September 1996). Fermat's Last Theorem: Unlocking the Secret of an Ancient Mathematical Problem. Four Walls Eight Windows. ISBN 978-1-56858-077-7. Dickson LE (1919). History of the Theory of Numbers. Volume II. Diophantine Analysis. New York: Chelsea Publishing. pp. 545–550, 615–621, 688–691, 731–776. Edwards, HM (1997). Fermat's Last Theorem. A Genetic Introduction to Algebraic Number Theory. Graduate Texts in Mathematics. 50. New York: Springer-Verlag. Friberg, Joran (2007). Amazing Traces of a Babylonian Origin in Greek Mathematics. World Scientific Publishing Company. ISBN 978-981-270-452-8. Kleiner I (2000). "From Fermat to Wiles: Fermat's Last Theorem Becomes a Theorem" (PDF). Elemente der Mathematik. 55: 19–37. doi:10.1007/PL00000079. Archived from the original (PDF) on 13 July 2010. Mordell LJ (1921). Three Lectures on Fermat's Last Theorem. Cambridge: Cambridge University Press. Panchishkin, Alekseĭ Alekseevich (2007). Introduction to Modern Number Theory (Encyclopedia of Mathematical Sciences. Springer Berlin Heidelberg New York. ISBN 978-3-540-20364-3. Ribenboim P (2000). Fermat's Last Theorem for Amateurs. New York: Springer-Verlag. ISBN 978-0-387-98508-4. Singh S (October 1998). Fermat's Enigma. New York: Anchor Books. ISBN 978-0-385-49362-8. Stark H (1978). An Introduction to Number Theory. MIT Press. ISBN 0-262-69060-8. Bell, Eric T. (6 August 1998) . The Last Problem. New York: The Mathematical Association of America. ISBN 978-0-88385-451-8. Benson, Donald C. (5 April 2001). The Moment of Proof: Mathematical Epiphanies. Oxford University Press. ISBN 978-0-19-513919-8. Brudner, Harvey J. (1994). Fermat and the Missing Numbers. WLC, Inc. ISBN 978-0-9644785-0-3. Edwards, H. M. (March 1996) . Fermat's Last Theorem. New York: Springer-Verlag. ISBN 978-0-387-90230-2. Faltings G (July 1995). "The Proof of Fermat's Last Theorem by R. Taylor and A. Wiles" (PDF). Notices of the American Mathematical Society. 42 (7): 743–746. ISSN 0002-9920. Mozzochi, Charles (7 December 2000). The Fermat Diary. American Mathematical Society. ISBN 978-0-8218-2670-6. Ribenboim P (1979). 13 Lectures on Fermat's Last Theorem. New York: Springer Verlag. ISBN 978-0-387-90432-0.
van der Poorten, Alf (6 March 1996). Notes on Fermat's Last Theorem. WileyBlackwell. ISBN 978-0-471-06261-5. Saikia, Manjil P (July 2011). "A Study of Kummer's Proof of Fermat's Last Theorem for Regular Primes" (PDF). IISER Mohali (India) Summer Project Report. Stevens, Glenn (1997). "An Overview of the Proof of Fermat's Last Theorem". Modular Forms and Fermat's Last Theorem. New York: Springer. pp. 1–16. ISBN 0-387-94609-8. Daney, Charles (2003). "The Mathematics of Fermat's Last Theorem". Archived from the original on 3 August 2004. Retrieved 5 August 2004. Elkies, Noam D. "Tables of Fermat "near-misses" – approximate solutions of xn + yn = zn". Ribet, Ken (1995). "Galois representations and modular forms" (PDF). Retrieved 2016-03-17. Discusses various material that is related to the proof of Fermat's Last Theorem: elliptic curves, modular forms, Galois representations and their deformations, Frey's construction, and the conjectures of Serre and of Taniyama–Shimura. Shay, David (2003). "Fermat's Last Theorem". Retrieved 14 January 2017. The story, the history and the mystery. Weisstein, Eric W. "Fermat's Last Theorem". MathWorld. O'Connor JJ, Robertson EF (1996). "Fermat's last theorem". Archived from the original on 4 August 2004. Retrieved 5 August 2004.